3D Printed Prosthesis Regenerates Nerves. Nerve damage has almost always been permanent. For younger patients there’s hope for full recovery after an incident but as we get older the ability to repair nerve damage decreases significantly. Indeed by the time we reach our 60s the best we could hope for is what’s called “protective sensation”, the ability to determine things like hot from cold. The current range of treatments are mostly limited to grafts, often using nerves from the patient’s own body to repair the damage, however even those have limited success in practice. However that could all be set to change with the development of a process which can produce nerve regeneration conduits using 3D scanning and printing. The process was developed by a collaboration of numerous scientists from the following institutions: University of Minnesota, Virginia Tech, University of Maryland, Princeton University, and Johns Hopkins University. The research builds upon one current cutting edge treatment which uses special structures to trigger regeneration, called nerve guidance conduits. Traditionally such conduits could only be produced in simple shapes, meaning they were only able to repair nerve damage in straight lines. This new treatment however can work on any arbitrary nerve structure and has proven to work in restoring both motor and sensory function in severed nerves both in-vitro (in a petri dish) and in-vivo (in a living thing). How they accomplished this is really quite impressive. First they used a 3D scanner to reproduce the structure of the nerve they’re trying to regenerate, in this case it was the sciatic nerve (pictured above). Then they used the resulting model to 3D print a nerve guidance conduit that was the exact size and shape required. This was then implanted into a mouse who had a 10mm gap in their sciatic nerve (far too long to be sewn back together). This conduit then successfully triggered the regeneration of the nerve and after 10 weeks the rat showed a vastly improved ability to walk again. Since this process had only been verified on linear nerves before this process shows great promise for regenerating much more complicated nerve structures, like those found in us humans. The great thing about this is that it can be used for any arbitrary nerve structure. Hospitals equipped with such a system would be able to scan the injury, print the appropriate nerve guide and then implant it into the patient all on site. This could have wide reaching ramifications for the treatment of nerve injuries, allowing far more to be treated and without the requisite donor nerves needing to be harvested. Of course this treatment has not yet been tested in humans but the FDA has approved similar versions of this treatment in years past which have proven to be successful. With that in mind I’m sure that this treatment will prove successful in a human model and from there it’s only a matter of time before it finds its way into patients worldwide. Considering how slow progress has been in this area it’s quite heartening to see dramatic results like this and I’m sure further research into this area will prove just as fruitful. 3D Printed Model Jet Engine Demonstrates Reverse Thrust. The engine that the model is based off of is a General Electric GEnx-1B, an engine that’s found in the revamped Boeing 747-8 as well as Boeing’s new flagship plane the 787. Whilst this model lacks the complicated turbofan internals that its bigger brothers have (replaced by a much simpler electric motor) the rest of it is to specification, including the noise reducing chevrons at the rear and, most importantly, the thrust reversal mechanism. What’s most impressive to me is that the whole thing was printed on your run of the mill extruder based 3D printer. If you’re interested in more details about the engine itself there’s an incredible amount of detail over in the forum where the creator first posted it. As you can see from the video when the nacelle (the jet engine’s cover) slides back a series of fins pop up, blocking the fan’s output from exiting out of the rear of the engine. At the same time a void opens up allowing the thrust to exit out towards the front of the engine. This essentially changes the engine from pulling the craft through the air to pushing back against it, reducing the aircraft’s speed. For all modern aircraft, even ones that use a turboprop rather than a fan, this is how they reduce their speed once they’ve touched down. Many of us have likely seen jet engines doing exactly that but the view that this model gives us of the engine’s internals is just spectacular. It’s one of those things that you don’t often think about when you’re flying but without systems like these there’s no way we’d be flying craft as big as the ones we have today. 3D Printing Our Off-World Colony. Human spaceflight is, to be blunt, an unnecessarily complicated affair. Us humans require a whole host of things to make sure we can survive the trip through the harsh conditions of space, much more than our robotic companions require. Of course whilst robotic missions may be far more efficient at performing the missions we set them out on that doesn’t further our desire to become a multi-planetary species and thus the quest to find better ways to preserve our fragile bodies in the harsh realms of space continues. One of the biggest issues we face when travelling to other worlds is how we’ll build our homes there as traditional means will simply not work anywhere else that we currently know of. This is when novel techniques, such as 3D printing come into play. Much of the construction we engage in today relies on numerous supporting industries in order to function. Transplanting these to other worlds is simply not feasible and taking prefabricated buildings along requires a bigger (or numerous smaller) launch vehicles in order to get the required payload into orbit. If we were able to build habitats in situ however then we could cut out the need for re-establishing the supporting infrastructure or bringing prefabricated buildings along with us, something which would go a long way to making an off-world colony sustainable. To that end NASA has started the 3D Printed Habitat Challenge with $2.25 million in prizes to jump start innovation in this area. The first stage of the competition is for architects and design students to design habitats that maximise the benefits that 3D printing can provide. These will then likely be used to fuel further designs of habitats that could be constructed off-world. The second part of the competition, broken into 2 stages, is centered on the technology that will be used to create those kinds of structures. The first focuses on technology required to use materials available at site as a feed material for 3D printing, something which is currently only achieved with very specific feedstock. The second, and ultimately the most exciting, challenge is to actually build a device capable of using onsite materials (as well as recyclables) to create a habitable structure with a cool $1.1 million to those who satisfy the challenge. Doing that would be no easy feat of course but the technology created along the way will prove invaluable to future manned missions in our solar system. 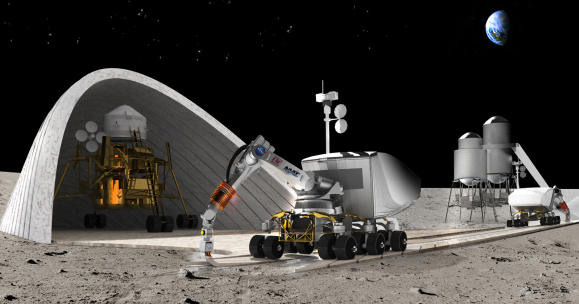 We’re still likely many years away from having robots on the moon that can print us endless 3D habitats but the fact that NASA wants to spur innovation in this area means that they’re serious about pursuing a sustainable human presence offworld. There’s likely numerous engineering challenges that we’ll need to overcome, especially between different planets, but it’s far easier to adapt a current technology than it is to build one from scratch. I’m very keen to see the entries to this competition as they could very well end up visiting other planets to build us homes there. 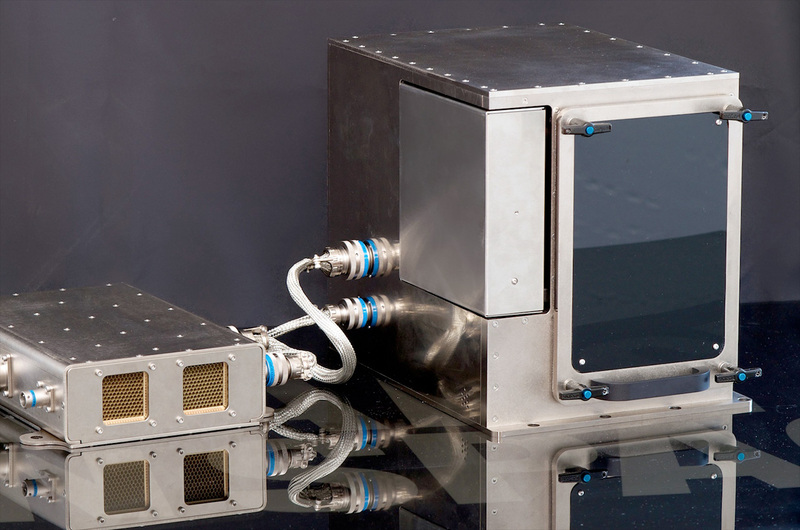 First Space Based 3D Printer Launched. The boom that 3D printing has experienced over the past couple years has been nothing short of astonishing. The industry started off as predominately as a backyard engineering operation, designing machines that’s sole purpose was to be able to print another one of itself, but it quickly escalated into the market we know today. Indeed it seems even the most wildest predictions about how it would revolutionize certain industries have come true with leading engineering companies adopting 3D printers for both prototyping and full blown production developments. With that in mind it was only a matter of time before one of them was bound for the International Space Station and yesterday SpaceX launched the first 3D printer to be based in space. The printer, made by Made in Space, isn’t simply a stock standard model that’s been gussied up to work on the ISS. It’s been specifically designed to work in the microgravity environment in low earth orbit, undergoing thousands of simulated zero-g tests (presumably on one of NASA’s vomit comets). Whilst the specifications might not be exactly astounding when compared to some of the printers available down here on earth, it only has a print volume of 5cm x 10cm x 5cm with ABS plastic, it has the potential to be quite revolutionary for NASA, not to mention 3D printing at large. One of the worst things about space travel is having to bring everything you need with you as there’s really no manufacturing capability to speak of in space. A 3D printer however provides the opportunity to ship up bulk supplies, in this case large reels of ABS plastic, which have a much greater density than the parts created with them will have. This drastically reduces the cost and complexity of shipping things up into space and provides a greater opportunity to create things in-orbit that might not be feasible to ship up otherwise. Of course whether or not 3D printing will be viable in space is another question, one which this device will attempt to answer. There’s a lot of use for 3D printed plastic parts on the ISS, notably pretty much any small clip or connector on the interior of the craft, however I feel that the real usefulness of 3D printer will come when they can print with metal. Right now there’s no good solutions for doing that via the extruder (although there are a few out there using solder, which doesn’t have the greatest construction properties) as most use the powder bed sintering process. As you can probably guess having a bunch of powder in a microgravity environment isn’t going to work out too well so I’ll be interested to see how future space based 3D printers deal with metal and other materials. It’s really quite exciting to see developments like this as there’s an incredible amount of opportunity for 3D printing to revolutionize several aspects of space travel. Indeed for long duration missions, one where component failure is a real risk, these kinds of in-orbit manufacturing capabilities are a necessity. Whilst we won’t be mass producing spacecraft parts in orbit any time soon these are the first few baby steps needed to developing that capability. And wouldn’t you know it Planetary Resources already has partnerships in that direction. I should have guessed! Details the makeup of the material used, as well as its structural properties, aren’t currently forthcoming however the company behind them claims that it’s about 5 times as hard as traditional building materials. They’re apparently using a few of these 3D printed buildings as offices for some of their employees so you’d figure they’re somewhat habitable although I’m sure they’re in a much more finished state than the ones shown above. Still for a first generation product they seem pretty good and if the company’s claims hold up then they’d become an attractive way to provide low cost housing to a lot of people. What I’d really be interested to see is how the cost and materials used compares to that of traditional construction. It’s a well known fact that building new housing is an incredibly inefficient process with a lot of materials wasted in during construction. Methods like this provide a great opportunity to reduce the amount of waste generated as there’s no excess material left over once construction has completed. Further refinement of the process could also ensure that post-construction work, like cabling and wiring, are also done in a much more efficient manner. I’m interested to see how inventive they can get with this as there’s potentially a world of new housing designs out there to exploited using this new method. That will likely be a long time coming however as not everyone will have access to one of these things to fiddle around with but I’m sure just the possibility of a printer of this magnitude has a few people thinking about it already. The Eerie Beauty of the Strandbeests. I remember attending an exhibition about Leonardo Da Vinci a couple years ago and I was astounded by the complexity of some of the machines he created. It wasn’t just that he’d figured out these things where no one else had, more it was some of the things that he designed didn’t seem possible to me, at least with the technology he had available to him at the time. Ever since then I’ve had something of a fascination with mechanical structures, marvelling at creations that seem like they should be impossible. My favourite example of this is Theo Jansen’s Strandbeests, a new form of life that he has been striving to create for the better part of 25 years. All of his designs are essentially tensegrity structures (I.E. all parts of the structure are under constant tension) arranged in such a way that when an outside force, in this case the wind at a beach, acts on them they’re able to walk. His initial designs only functioned when the wind was blowing however further designs, many of which you can see in the video, are able to store wind energy and then use it later through some rather clever mechanical engineering. Unfortunately I couldn’t find the best video which has Theo explaining how they work as that one also shows another Strandbeest he created that would avoid walking itself into the ocean (something which I’m still not sure I understand how it works completely). The idea of creating a new form of life, even if it doesn’t meet the 7 rules for biological life, is a pretty exciting idea and one that’s found an unlikely form of replication: 3D printing. After many people made their own versions of his Strandbeests (I even printed a simple one off, although it broke multiple times during assembly) Theo has made the designs available through Shapeways, essentially giving the Strandbeests a way to procreate. Sure it’s not as elegant as what us biological entities have but the idea does have a cool sci fi bent to it that tickles me in all the right places. Taken to its logical extreme I guess a Reprap that printed Strandbeests that assembled other Repraps would be the ultimate end goal, although that’s both exciting and horrifying at the same time. 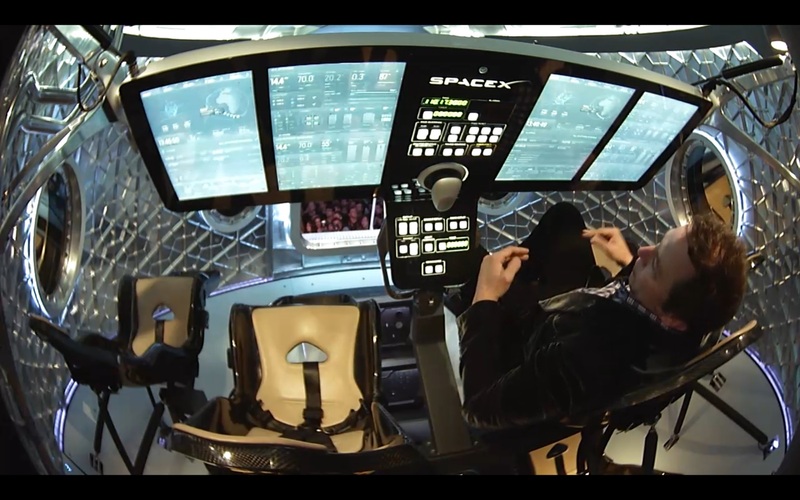 SpaceX’s Dragon V2 is Just Incredible. SpaceX’s Dragon capsule has proved to be an incredibly capable craft. Ever since it made it’s debut journey to the International Space Station back in 2012 the craft has made another 3 trips as part of the Commercial Resupply Services contract that SpaceX has with NASA. Should all things go to plan then 2014 will be the Dragon’s busiest year yet with a grand total of 4 launches planned, 3 of those to occur within a couple months of each other. Still the current Dragon is only half the puzzle for SpaceX as whilst it’s quite capable of delivering cargo to the ISS the human carrying variant has remained as a concept for quite some time. However that all changed last week when SpaceX announced the Dragon V2 capsule. The original Dragon capsule was readily comparable to Soyuz and Apollo style craft, except for the fact that it couldn’t carry a single human into or back from orbit. The Dragon V2 on the other hand is really unlike any other craft, being able to carry up to 7 astronauts (equal to that of the Space Shuttle) and also with the capability to soft land anywhere on Earth within a very small area. That’s something that no other craft has ever been able to boast previously as even the venerable Space Shuttle required a runway to land and there were only 2 places on Earth capable of receiving it. Other notable improvements include fully automated docking and the world’s first fully 3D printed rocket engine, the SuperDraco. Inside the capsule is when things start to get really impressive. however. If you’ve ever seen the inside of a Soyuz capsule you’ll know things are pretty tight in there and the Dragon V2 isn’t that much bigger. The interior design of the Dragon is where the big differences come in to play as you can see in the screen capture above. That giant screen flips down from the ceiling, making ingress and egress from the capsule extremely easy whilst at the same time providing a lot more room inside the capsule than you’d traditionally see in a craft of this nature. I’m guessing that they’re likely touchscreens as well, providing an incredible amount of flexibility in turns of what those panels can be capable of. The ability to land anywhere in the world, even on land, is a pretty incredible achievement for SpaceX. Right now when astronauts and cosmonauts come back from space they come back on what’s called a ballistic trajectory, I.E. they’re falling to the ground like a rock. The Soyuz capsules have “soft landing” rockets which fire moments before they hit the ground to reduce the impact however they still get rolled head over heels several times before coming to a complete stop. The Dragon V2 is luxury by comparison, able to come to a soft landing right side up every time. Whilst many of the launches and landings will occur at the same places (due to orbital mechanics for the most part) the ability to land somewhere else, especially in an emergency, is an incredibly useful feature to have. If everything goes perfectly we could see the first unmanned demonstration flight of the new Dragon capsule towards the end of next year with the first crewed mission coming in 2016. That’s likely to slip, something which NASA is prepared for as they have secured spots on Soyuz craft through 2017, but even that is a pretty incredible turnaround for a manned craft. Indeed SpaceX will achieved in under 20 years what many government agencies took far longer to accomplish and it seems like they have no intention of slowing down. Printing Nutrition: It’s Closer Than I Thought. As many know my experience with 3D printing has come with mixed results, as the kit I bought with 3 friends required more calibration than I was willing to do and my friend’s Solidoodle proved to be a reliable way to create the objects I needed. I’m still highly interested in the area (I was going to post a review of Microsoft’s 3D Builder but just never found the time to hook it all up) and I strongly believe that the commoditization of manufacturing at the small scale will prove to be revolutionary. One area of particular interest was the idea of a food printer, something that could potentially make a meal out of some base nutritional components. NASA stated investigating the idea of 3D printing food a little while ago, investing a small amount of money into research to create a device capable of creating edible foodstuffs on the International Space Station. Primarily this was to fuel a longer term goal to provide food for an interplanetary trip to Mars as its believed that 3D printed food could dramatically reduce waste and improve efficiency with transported materials. Whilst this current demonstration appears to be limited to producing pizza (something which seems a perfect fit for a first run) NASA’s vision is for something far more general and it looks like they’re well on their way to achieving that. It’s a big step considering that we’ve had printers capable of producing chocolate models for some time, but the leap to other food has proved somewhat elusive. It will likely be quite some time before it gets much more general than your run of the mill pizza however although some of the designs making the rounds are really quite impressive. Time will tell if they’ll ever become mass market devices but I can definitely see themselves finding a home in space stations and high end restaurants looking to create truly unique dishes. The Revolution Will Be 3D Printed. It’s been about 18 months since I posted about my first forays into 3D printing, an exercise that was fraught with complications, frustrations and lackluster software. It should then come as little surprise to know that we haven’t been able to get it to print much since then with most of the test cubes failing at about 20% in. I know that it’s a solvable problem, one that I was getting close to resolving, however the amount of time and energy I put into tuning it burnt me out on the whole idea and I trucked the printer off to one of the other contributors to let them have a go on it. Surprisingly though this didn’t sour me on the whole 3D printing scene and I’ve been continuously ogling printers ever since. Then along came PAX Australia, the biggest event of its type to grace the shores of Australia and an opportune moment for me to embrace my inner cosplayer. My character of choice is Adam Jensen, the augmented star of my choice for game of the year 2011, Deus Ex: Human Revolution. Now I’m not exactly great at crafts or building things but Jensen’s costume seemed to be well within my reach thanks to the availability of a trench coat that gets you about 90% of the way there with the rest of the items being easily procured elsewhere. There was one piece that I wouldn’t be able to get elsewhere however: the eye augments. Searching around the Internet showed that many people had created their own with majority of them favouring a particular brand of sunglasses that was close and could be modified slightly to give the required look. Even that seemed a little out of my reach so I resigned myself to digging up a 3D model extracted from the game and getting it printed at Shapeways. However after all the fooling around I had done with 3D printing previously I knew that I should get a couple prints done first to make sure the size was right and with my printer still far away from being serviceable (at least last I heard of it) I hit up one of my mates who’d recently come into possession of a Solidoodle 2. Since the prints he’d done surpassed anything I had done I figured it’d be worth trying it out on his before I sent them to Shapeways. Those following me on Twitter will know that I’ve since done a couple test prints of the augments and the results have been quite astounding. The first round was done at 0.3mm and honestly was fairly serviceable, requiring a bit of finishing to smooth out all the extraction lines. Printing at 0.1mm resolution however was a different ballgame altogether and the final pieces from it were almost good enough to not require any further work, should you not be a slave to an impertinent perfectionist like myself. I’ll probably not be bother to get them done at shapeways now because of this which is something I didn’t expect to happen when I first set out on this quest. Going through this experience brought all those stories I had been reading about the great success stories I had been reading about 3D printing. It wasn’t just about people creating things at home nor the controversial printed gun, no it was more like the 3D printed jaw that’s been implanted into someone or even the first fully articulated 3D printed gown. 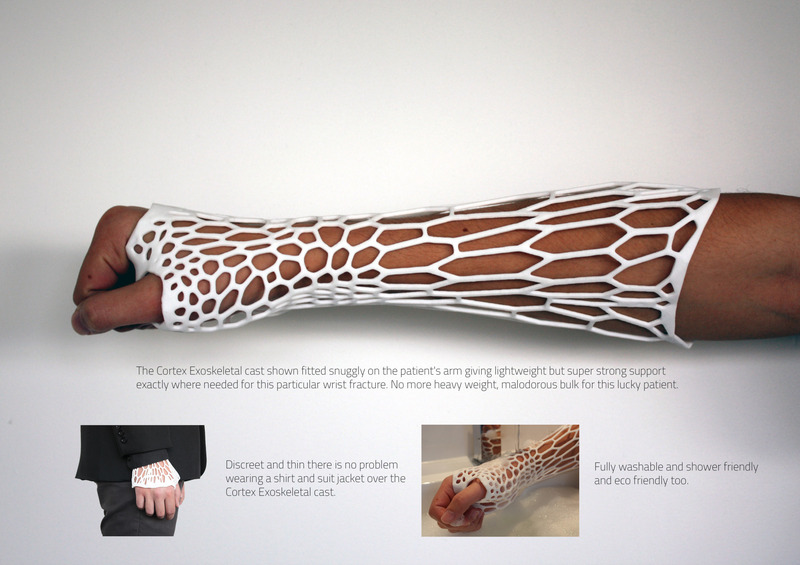 In a rather interesting coincidence it also came to my attention that someone had redesigned the tried and true plaster cast used to set broken bones with a 3D printed design, one that has multiple advantages over the current style. As someone who endured with a full length arm cast as a 10 year old (I.E. right up to the elbow) I can attest to all the issues mentioned here being real and something that I would’ve gladly done away with. The design seems so simple with you think about it but without 3D printing it would be nearly impossible to accomplish, especially in the time frames required to set a bone so that it heals properly. You can then imagine this kind of design being applied elsewhere from replacing casts on other parts of the body to improving things like neck braces, splints and other supportive medical devices. We’re a while away from seeing these kinds of things in practice but considering the rapid adoption rate we’re seeing with 3D printing in other medical practices I can’t imagine it’d be too far off. Now I’m not about to start professing about how 3D printing will be the death of manufacturing or how it will bring the “problems” of the digital world to the physical but it’s hard to deny the change that’s occurring. Whether it’s printing cosplay accessories or replacement jaw bones 3D printing has enabled all sorts of things that just weren’t possible previously. Even Microsoft has recognised its importance by incorporating 3D printing support directly into Windows 8.1 something that will undoubtedly push the industry even further into the mainstream. The 3D printing revolution is happening, and it’s freaking awesome.